Record text documents into audio files. Is there a better alternative to Text2Tape? Is Text2Tape really the best app in Audio category? Will Text2Tape work good on macOS 10.13.4? 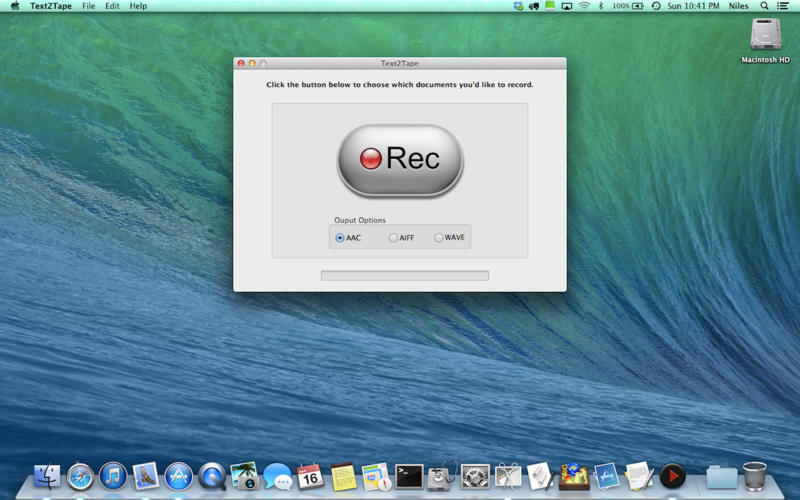 Text2Tape is an application that lets you record documents into audio files using the Mac's built in speech technology. Text2Tape can batch record multiple supported documents in any combination. Supported document types include TXT, RTF, DOC, DOCX, XML, HTML, ODT, and Webarchive. Each audio file will be named after the document that it was recorded from automatically. Audio files will be recorded in the voice that you have selected in the Speech Control Panel. Convenient button is provided for quick access the Speech Control Panel to make changes. Text2Tape needs a review. Be the first to review this app and get the discussion started! Text2Tape needs a rating. Be the first to rate this app and get the discussion started! Supported output audio formats are AAC and AIFF. While AAC is preferred because of it's significantly smaller file size, some 3rd party voices may not support it. For that reason, AIFF is included as well.